This will be my first long road-trip with Boca, and the longest I've spent away from Ruby since adopting her almost three years ago. I'm really looking forward to the extra time to bond with Boca - as the low-maintenance dog in the family I feel like she is somewhat in her reactive little sister's figurative shadow. Knowing that this trip will be more activity and crowds than Boca is used to, we've been trying to get as many outings under her harness as possible before we hit the road. 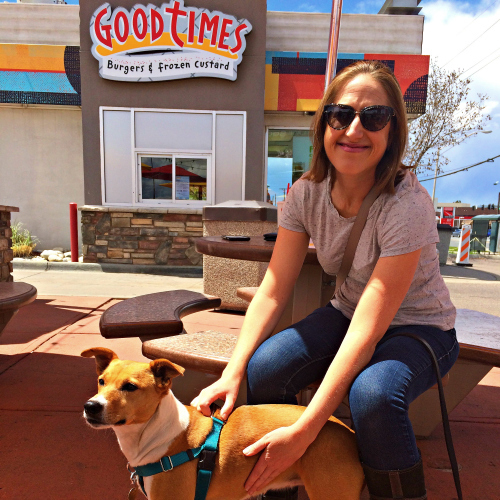 When we were invited to visit a nearby GoodTimes for frozen treats, we couldn't say no. As a vegetarian, my fast food options are limited, but they actually have a few things I can eat, as well as delicious frozen custard. 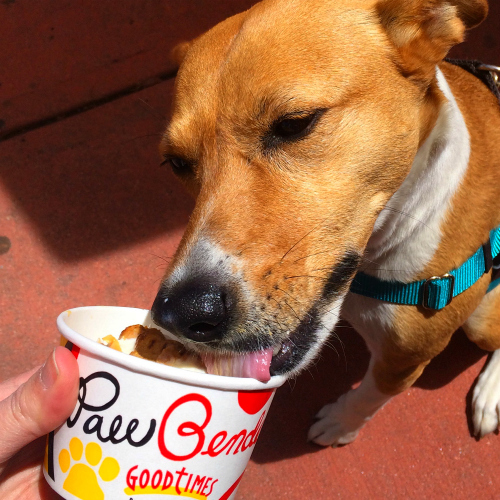 I had a strawberry cheesecake Spoonbender, while Boca relished her first Pawbender, a doggie sundae made with vanilla frozen custard, dog biscuits and peanut butter. As always, she gained a couple of new fans - a mother and daughter out for Mother's Day who wanted to know all about Boca and shared pictures of their own rescue dogs. 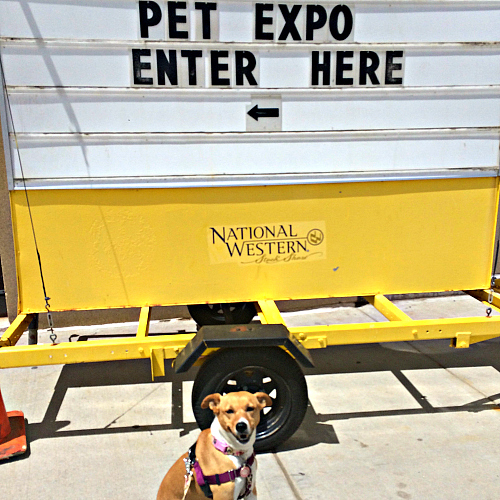 Our next adventure was a visit to the Rocky Mountain Pet Expo. I was hoping for a lot more vendors and was surprised how few there were in such a dog-friendly city. It was still a good opportunity for Boca and I to negotiate some crowds - while it wasn't uncomfortably packed, the expo took place in a big concrete hall, so the noise level was pretty high. I could tell Boca was nervous - she had her tail tucked and didn't like it when other dogs were barking - but I was able to cheer her up with a steady stream of treats. 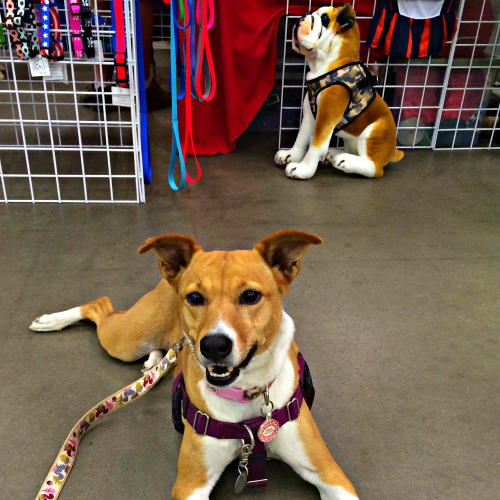 Even when she is a little unsure, Boca will normally just lay down, even with other dogs in close proximity. 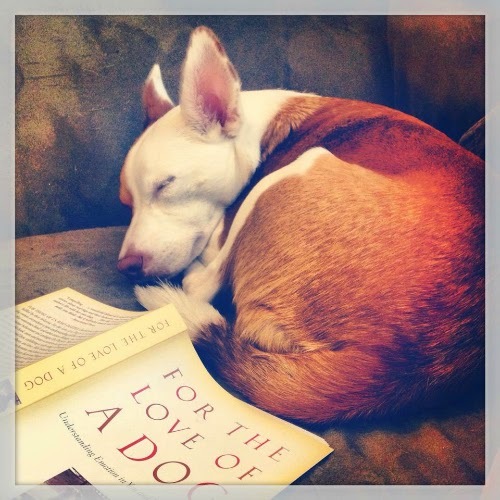 I'm confident that she'll be able to relax by my side during the BlogPaws presentations. 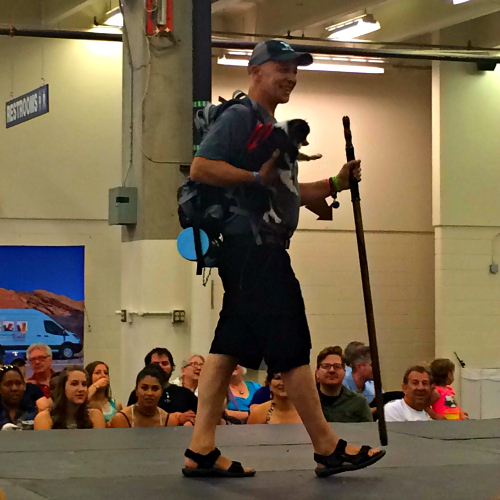 One of the highlights of the Pet Expo was the fashion show, where we got to see one of our volunteer friends from Paws on the Ground strutting his hiking haute couture with puppy mill survivor Lee the One and Only. 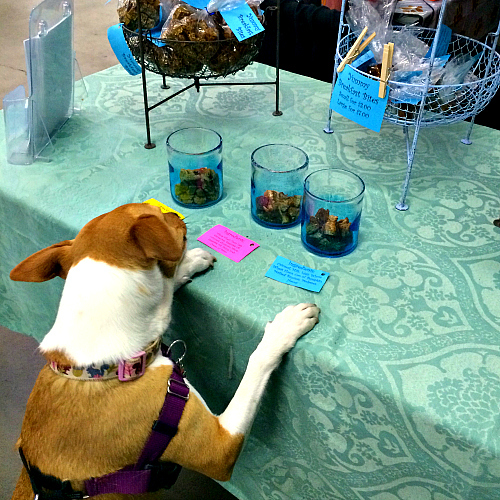 Boca got to sample some locally made dog treats, but had a hard time choosing which flavor she liked best. Since it was a warm day, I brought along our cooling mat in the car - something I will be certain to pack on our trek across the southwest. 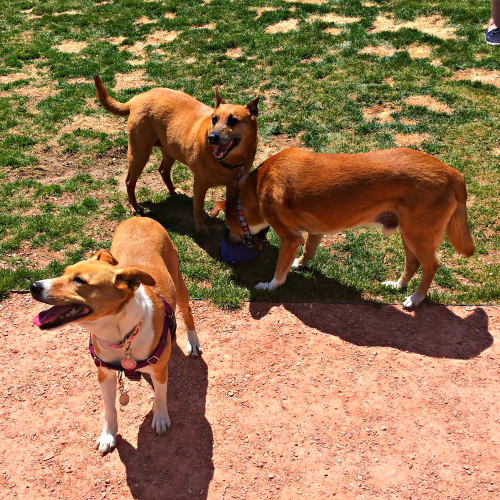 We had one more stop to make - a playdate with some of Boca's potcake friends, Humane Society of Grand Bahama alumni Abby & Finn! These three met last summer, and seemed to remember one another and continue their easy camaraderie. They ambled around the fenced dog area sampling grass, sharing water and recharging in the shade. Boca was especially cute with two long-haired Dachshunds and I was impressed as always by her social skills. I know she is going to make even more friends in Phoenix! In June we'll be starting to think about packing our bags, letting you know about the dog-friendly accommodations we've scouted out along our planned route, and hosting a giveaway with the chance to win some Open Farm food for your dog! 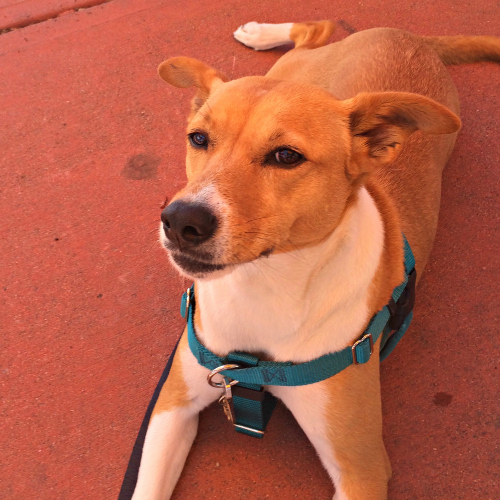 Boca is going to be such a good traveler during your roadtrip and at BlogPaws! Have a great time! 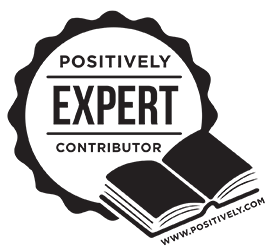 Yay, Boca! 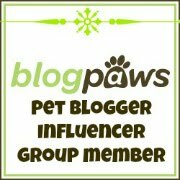 I'm excited that she's getting some special adventure time, and I wish I were going to BlogPaws so I could meet you both! We are making the road trip with Bentley and Pierre. I can't wait to see you. Glad to hear that Boca's handling all of the excitement so well. Can't wait to hear about your big adventure!